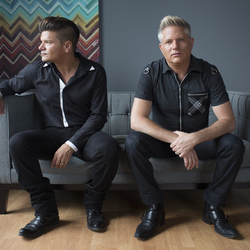 Julio is the Artistic director & Derrick is Creative director of Valentini hair design in Guelph, Ontario. They are both platform artist for Matrix for over 23 years. Their professional and personal relationship was a result from their dynamic chemistry working with the brand. Julio's love for colour and Derrick's passion for cutting & finishing make them a sought after team. They have traveled and explored all over the Northern America, Europe, and Asia sharing their talent and humour. They have won a Mirror Award for Salon Team Ontario in 2013. Julio has been a finalist for 2018 Master Colourist and together for Salon Team of the year For Contessa.